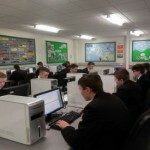 At Ashfield Boys’ High School we use ICT to enhance and add a new dimension to the learning process. ICT is increasingly becoming part of our daily lives, in the way that radio and television did fifty years ago. This is amply illustrated by the use of mobile communications, games consoles, digital cameras and other technologies in the home, school and workplace. ICT plays a significant role in education at Ashfield Boys’ High School. It can act as a major catalyst in transforming education, stand alone as a discrete subject and support other subjects as a cross-curricular theme. 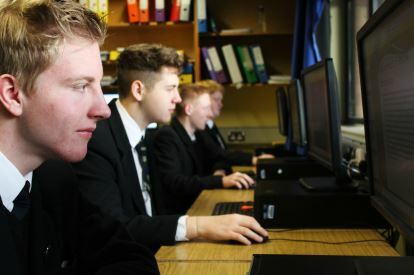 Pupils at Ashfield Boys’ High School have the confidence and competence in the use of ICT to enhance all aspects of their learning experience. Teachers are competent in the use of ICT so that they are able to use it in all aspects of their daily work. The dynamic and cutting edge world of creative interactive digital media is fast-moving. It requires teachers who are up-to-date with new technologies and who can respond quickly to change, growth and innovation. These teachers are skilled in new multimedia technologies such as Graphics, Web Design, Digital Video Editing and Multimedia Authoring. The formation of a new Digital Media Department will endeavour to follow a vocational path for its students preparing them to work as web designers, graphic artists, multimedia producers, animators, sound designers and storyboarders. Developments in ICT education run parallel with increasing investment in computer hardware, software and communication equipment all of which is similar to equipment used in industry, commercial and further/higher education. Our stated whole school aim is to ensure that all pupils leave with at least one ICT related qualification and our innovative department’s growth continues with the introduction and development of various pioneering ICT/Digital Media courses. 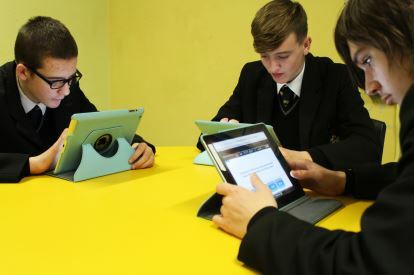 The dramatic growth in the need for ICT is being taken seriously by our senior management team and the school’s vision for ICT is driven by the potential to improve teaching, learning and achievement. Research evidence shows that ICT can stimulate, motivate and spark pupils’ appetites for learning and helps to create a culture of success. As digital media now plays an increasingly important part in our everyday lives and in the world of work it is vital to ensure these ‘screenagers’ are going to be active participants, not just passive recipients. At ABHS we feel confident that the ICT team is capable of delivering a relevant, practical and wide-ranging subject in these ever changing times. By pursuing this vision, we are creating an e-confident school. At Key Stage 3 the ICT curriculum is mainly skills based giving the pupils the necessary proficiency in using the core digital applications needed for them to progress such as digital image manipulation and digital video editing. This course uses e-assessment where the pupil’s skills are assessed using online based examinations. Each year group also study a ‘mini-module’ on eSafety. Pupils will gain a variety of knowledge, skills and understanding by completing this level 2 course: to include online services, how the internet works, web development, and many more…. Where this course takes you? All of the above units are internally assessed through the use of assignments and is the equivalent of one GCE A Level. 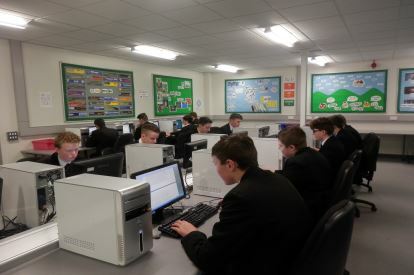 Pupils will gain a variety of knowledge, skills and understanding by completing this level 3 course: to include hardware and software in a computer system, designing digital graphics, the development stage of websites and databases and key skills for employment within the IT industry.